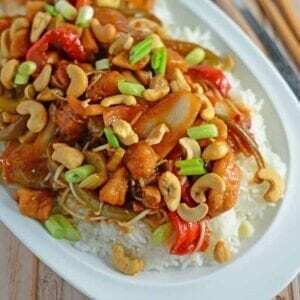 Slow Cooker Cashew Chicken is a favorite chicken crock pot recipe using lightly breaded chicken with a flavorful cashew sauce, celery, bean sprouts, onion and bell pepper! In a medium mixing bowl, combine dry ingredients for chicken. Toss bite size pieces in flour mixture. Heat vegetable oil in a large skillet. Shift out chicken pieces, adding to hot oil. Brown lightly, about 5-6 minutes. Remove to a paper towel lined plate. Chicken may not be fully cooked. Combine soy sauce through bell pepper in slow cooker bowl, mixing well. Add chicken and set to low for 3 hours. Right before serving, add bean sprouts and toss to coat. Sauce should have thickened. Spoon over jasmine rice, topping with cashews and scallions. You can use raw, cubed chicken breast without breading, add to slow cooker with sauce and cook on low for 6-7 hours. Whisk together 2 tablespoons cornstarch with 2 tablespoons water and stir in before serving to thicken sauce. You can use up to 4 chicken breasts OR 8 boneless chicken thighs with the same amount of sauce and vegetables. If you use raw chicken in the crockpot, increase cooking time to 4.5 hours on low setting.